In this interview, Michael Steiner, Member of the Executive Board Research and Development at Porsche, explains the realignment in motorsport, the switch from LMP1 to Formula E, and whether Formula 1 is under discussion. Why is Porsche leaving the LMP1 class and entering Formula E? We have decided to reorganise our motorsport strategy and align it with our corporate strategy: As well as pure GT road-going sports cars, fully electric sports cars are a fixture of this strategy. Both need to be reflected in the Porsche motorsport environment of the future. Sports cars will always be central to Porsche, and they will continue to be powered by combustion engines for the foreseeable future. E-mobility is the big new issue, particularly Mission E. In the future, we will split our commitment between conventionally powered products in GT and customer racing, and an increased focus on electromobility. That is why we will enter Formula E in 2019. What is the specific motivation behind the commitment to Formula E? As we are entering Formula E with our own team, which is based at our location in Weissach, we can generate added value in the development of future electrically powered series vehicles based on the large number of very interesting technical topics in Formula E.
Is there really so much room for development in Formula E? The series is developing in an interesting direction. Think, for example, of the rear axle with the electric motor, which manufacturers are able to design themselves within the regulations. Or take the inverter and the battery management, where there will also be more freedom. In the relatively short term, it is expected that a better battery will be used in Formula E, which will eliminate vehicle changes during the race. There are also planned increases in drive performance. And brake-by-wire is coming, along with other things. We have seen the roadmap on the technical side. The regulations will start to open up and the planned developments are very interesting. Does this mean you are expecting Formula E to go from being a marketing tool to a technology formula? That is exactly what we are expecting. We would not make such a wide-ranging strategic change for an event that only had marketing potential. If Formula E were just a short-term trend or a passing fad, we would certainly not become involved. Do you have a starting place in Formula E? Places are limited. Porsche will start with its own works team; we will not buy one from somewhere. That underlines how seriously we are taking this series. Why is Porsche not entering the competition until the sixth season, which is more than two years from now? This is due to a number of factors, including how the regulations are written; in other words, when you can receive vehicles, and when you can start testing and therefore become an official participant in the event. It would not have been possible to enter the 2018/2019 season because, for example, we would not have been able to compete with our own electric motor. So that was not an option. How do you assess the LMP1 class in retrospect? With the LMP1 class, the World Endurance Championship established revolutionary efficiency regulations that set the standard. We value these regulations greatly and were also very successful in the past four years, with three Le Mans victories and two World Championship titles in the team and driver classification. But the fact is that competitors left. The current situation with only two participants in the LMP1 class is only of moderate interest to us. Regarding the future of the class, cuts have been made to reduce costs. For example, the 10-MJ hybrid class will be suspended. We think this is understandable, but in the end it was not possible to generate any enthusiasm among new manufacturers in this area. When it comes to the future of the LMP1 hybrid class, there are also a number of question marks that did not exactly favour Porsche’s continued participation. Isn't that true? Yes, of course there are question marks there. Attentive observers have been asking this question since at least October 2016, when Audi left. We have no doubts about the future viability of endurance racing itself, but the current LMP1 prototype generation was obviously only lucrative and compelling for a limited time period. However, we are sure that new technological windows will open up in endurance racing in the future. What role did the state of the World Endurance Championship play in the decision, particularly with regard to marketing, visibility on television and return on investment? These are important points that we discussed with the World Championship organisers very openly and for a very long time. Taking a few steps back to reflect, only the race in Le Mans and the legend associated with it justify a commitment on this scale. Over the past few years, efforts to raise the series as a whole to an adequate level of visibility have not really succeeded. What will happen to the LMP1 team? Will you have to let employees go? We will need all of these employees in the future. There are no questions at all over this. The team we have formed for the LMP1 project is a highly motivated, first-class sports team that has an enormous wealth of knowledge. We want to keep this team at Porsche – meaning all employees who work there, to the full extent. We will therefore continue to use the entire team – we already have a concrete plan in place – for the engineers, the mechanics and the drivers. How do you plan to implement this if you are eliminating the LMP1 programme? First of all, the team will see this season through to the end, obviously with the goal of winning races and titles. 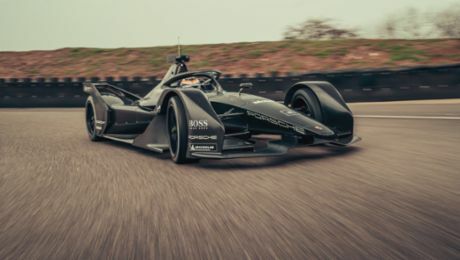 We also want to involve as many employees as possible in the development activities and the first testing activities for Formula E. This will require all the expertise from virtually all our specialist areas. In addition, we want to further strengthen our GT commitment, for example in racing series in which we have not been so active to date. In this area too, we can make good use of additional resources. Recently, there has been speculation in the media about whether Porsche might enter Formula 1 as an engine manufacturer. What is behind this speculation? Like other manufacturers, we participate in discussions on the future Formula 1 powertrain at the invitation of the FIA. At the moment, the team in Weissach is not working on an F1 engine, but it is working on a high-performance, high-efficiency engine, specifically at the design level. So far, we have not decided what we will do with this engine, or in other words whether we will use it in series production or in motorsport. If the LMP1 programme had continued, we would have worked on efficient high-performance engines, and we are now pushing ahead with this development. The development contract with the engineers will run for the next 18 months. Let me try to pin you down once again: Will you not be entering Formula 1 in 2021? I am not working on that assumption, but there is no statement to be made about this. This text originally appeared in auto motor und sport. Porsche is expanding its charging service for plug-in and electric vehicles by five countries and new functions.